﻿Accomplished wine maker Louis Nel has a track record of successes rather like film stars winning Oscars! Most of us who enjoy fine wine have bought a bottle or two from well known wineries such as Warwick, Hidden Valley and Lands End. But what many of us may not know is that Louis Nel has been a huge influence behind the fine wines that are produced from these farms. Those who have met this amazing man will understand that behind his coyness is a talent which has made him a sought after personality in the South African wine industry. Today Louis continues as consulting wine maker to Hidden Valley while building on his own brand, Louis Wines. The first wines under his own label were two reds, one a blend and the other a top end Cabernet Sauvignon. He later followed these with a delicious Sauvignon Blanc (a cultivar Louis loves working with!) and now his latest release the Black Forest Red! The story behind Black Forest is that Louis wanted to make a more affordable wine than his current range, and when he found that the wine he made was abundant with cherry and chocolate flavours similar to Black Forest cake, the name was born! Louis owes his winemaking roots to his mother, who used red wine to colour the icing on his first birthday cake, so the name seemed apt! 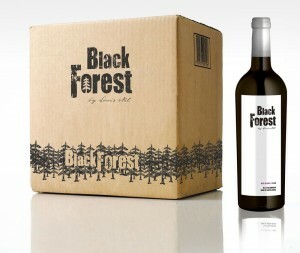 Black Forest 2010 is a blend made from Merlot (85%) and Shiraz (15%) sourced from the Stellenbosch region. Vinified separately the wine was transferred to French Oak barrels for malolactic fermentation and finally aged in barrel for a total of 16 months before blending and bottling. The wine offers sumptuous, brooding, dark-toned berry fruit aromas with flavours of bursting mulberry fruit, showcased with spicy white peppery whiffs. Enjoy with a good fillet of beef or a rich mushroom based pasta dish. Hi Louis gaan ons jou by die Johannesburg voedsel_ en wynskou sien?